It’s National Craft Month and National Kite Month! You know what that means? It’s time to get our crafting pants on to whip up a kite. With this gloomy, chilly weather outdoors it’s the perfect time to hole up inside preparing an excuse to run wildly through fields of flowers when the sun finally starts heating things up. There are tons of online instructions and lots of reasons for you to consider trying them out. Summer fun can be costly, but not when you’ve got a kite! The materials to make the kites themselves are inexpensive. You can gather some friends for a kite crafting party then once that green grass pops back up invite the same people for a kite flying picnic. That’s two cheap friend dates planned right there. Sweat inside at some gym or frolick through the park for exercise? Enough said. Kite flying gets you outdoors, potentially chilling with friends and being active, and helps get your mind off of stressful daily tasks. It has you looking up at the sky instead of down at a computer, book, food, etc. so you’re stretching those muscles! 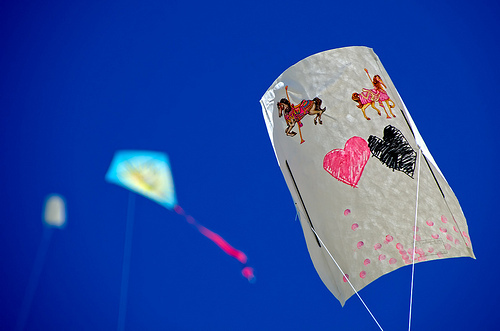 There are many health benefits to kite flying that all help relieve stress. The only real trouble with kites is it seems difficult to make one the eco-friendly way! Perhaps reuse dowels from another project? Reuse plastic bags? Have you got any suggestions or experience making Earth-friendly kites?